Today's mission was to share with one of the ways to I help keep life manageable in my household. It used to seem like I was constantly stopping whatever I was doing to get my daughter a snack. One day after many interruptions to what I was trying to do, I realized my daughter was older now and with the right circumstances she was capable of getting her own snack. My cousin told me she had a place for snacks where he kids could simply help themselves. Granted her kids are a lot older than my daughter, but she is still old enough she can pull a granola bar out of a cabinet if she wants it. 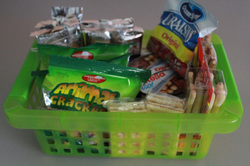 That is when the idea was born to create a "snack basket". My search for a cheap container began with a trip to the local Dollar Tree. They had small baskets that were just the right size to fit inside my cabinet, while still being able to hold several snacks.I decided to purchase two of these baskets, one for my cereal cabinet and one for the refrigerator. My next task was to determine what things I would keep in these baskets because I wanted the snacks to be healthy since the goal was to allow my daughter the option to get her own snack. I decided to purchase things like granola bars, raisins, etc. For the refrigerator basket, I cut up baggies of carrots, cucumbers, etc. Both baskets are placed within my daughter's reach so she can just grab something when she's hungry. I don't put everything I purchase in the basket at one time either. I usually place 1/2 a box of whatever I buy in the basket and store the remainder on my pantry shelf. Now when my daughter is hungry she can go to her snack baskets and help herself. She loves the independence of being able to get something herself and I found that I'm not constantly having to stop folding laundry or sweeping or whatever task I am working on to get her a snack. Weekday mornings can be a challenge for any parent. Not only do you have to get yourself ready for the day, you have the responsibility of getting multiple people ready for their day too. Sometimes this can feel like an overwhelming task that turns into a race against the clock. That's how I felt today. We made it through our first week back-to-school smoothly; however, after a three-day weekend and a couple of chaotic mornings where my little one reverted back to "summer break mode", I realized something needed to change. Although I have a daily routine established, that doesn't mean it isn't met without a challenge at times. This morning started off great, but that quickly unraveled when my daughter decided she had her own agenda and the things I knew she needed to do weren't part of her plan. She had her own mission and it wasn't to get ready for school. After what felt like constant reminding and a few times back in the house because she forgot something, we were out the door and on our way. I dropped her off at school with the thoughts of the morning racing through my head. I needed find a solution before this becomes an on-going problem. So began my mission to help my daughter establish her own routine. I'm not talking about anything elaborate like my routine - just the basic things like do homework, put your homework in your backpack, put lunchbox in the kitchen so I can wash it, pick out clothes for the next day, etc. The ultimate goal is to keep her on task. This will help reduce stress for both of us and make our mornings and bedtimes go more smoothly again. My first thought was to post a list on her bedroom door so she could see it. If it is written down, she can't try to outsmart me by giving me the excuse "you never said I had to do that" or "I didn't know I had to do that". It's easy to point to the chart and say "it says it right there". Plus it gives me a reference point to make sure I didn't accidentally overlook something she needed to do. My biggest concern was that a list is boring and boring can be forgotten quickly. There needed to be an action part for her. Something simple like being able to check off her tasks as she completes them. It needed to be enough to engage her attention like adding check marks to give her a sense of accomplishment. After strolling around at the neighborhood Target, I came across a dry-erase solution I thought would work. A simple day-by-day list with rewards at the bottom. It came with a dry-erase marker and magnets for assigning tasks. There were cute little drawings, bright colors, and childish looking fonts that make it appealing to a small child. It was just basic enough to work! 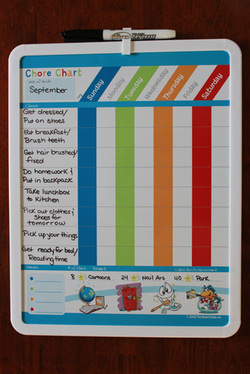 Once I got home, I assembled the chart and filled out the "To Do" list then placed it on lower half of my refrigerator within my daughter's reach so she can mark off her tasks as she completes them. I decided not to use the included magnets because I figured she'd have them everywhere except where the belonged. Instead, she can use the dry-erase marking to create her own little stars. When I picked her up from school, I made a big deal about getting home so I could show her the really cool chore chart I bought today. She was so excited to get in the house to see it. She looked it over, read her tasks, and was like "Oh I see, these are things I already do. This is really great. Now I can mark off things so I don't forget to do them." Laundry, dusting, vacuuming, mopping - all dirty words (shudder). It seems like there is never an end to maintaining a clean house because just when you finish one thing you find something else that needs to be done. To my dismay I realize that the only cleaning fairy there is around here is me. I'll admit there are times when it felt like the house was winning. I learned that in order to defeat the beast I needed a weekly routine to keep things on track. The house didn't become a monster out of control over night, it took time to get that way and it will take time to bring it back to a manageable state. With that in mind, it's important to establish a weekly routine to keep the everyday stuff under control while you tackle the big stuff and I'm going to share with you how I do it. This routine may need to be tweaked to fit your schedule, but it will give you a general idea of where to begin planning your own routine. Monday is my major cleaning day. One of my friends recently told me she does her major cleaning on Friday because she wants the house clean because she knows her husband is home all weekend and he'll point out things that need done if she hasn't cleaned. I clean on Monday because my family has been home all weekend and by Monday the house is in need of my attention. Once hubby has left for work and both kids are at school, it's just me and the house. Now that may seem like an open invitation to sit back and relax because finally there is peace and quiet. Nope, not this girl. I can't stand to sit and look at the mess because I know it's not going to clean itself no matter how much I wish it would. Yes this list consumes a good chunk of my day, but the rest of the week goes much more smoothly if I start this way. The rest of the week doesn't look nearly as overwhelming and I assure you once you get your housework under control the list of tasks I have above doesn't take as long as you might think. I love to take walks, but sometimes my schedule just doesn't allow it so I have to make time in my weekly routine to ensure I get out to walk for at least a little bit. It's that time of the year again! Waking up early with lots to do in a very short amount of time. Like many of you, I have children who attend school (though one has to go quite a bit earlier than the other) and there are many tasks I need to accomplish before they go. My son is pretty easy to get ready for school because really all I have to do is wake him up. Technically, he's old enough he could fix his own breakfast, but I'm already up so I put something together for him each morning. He gets dressed, eats, brushes his teeth, then off to the bus stop he goes. My daughter is an entirely different story. She's only 7 years old, so I have to keep her on task or things would never get done. This task isn't the easiest either because the morning can be filled with "little girl meltdowns" that make everything I'm trying to accomplish come to a crashing halt. This school year, I decided to change my approach to getting ready for school in hopes of calming any storms before they develop. I hope my morning routine can help you find ways to make your mornings go smoothly. Check my daughter's backpack when she comes home from school (a simple task that's easily forgotten with all the chaos of everyone coming home and after school activities). Make sure all homework is returned to her backpack. Help my daughter pick out her clothes and shoes for the next day.